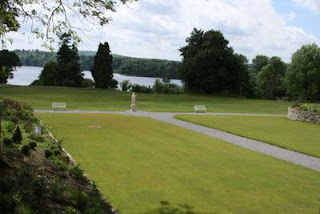 I had hoped that Kilronan Castle would be a lower-budget, Ashford Castle-type experience. It is situated north of Boyle in Co. Roscommon, on the small but lovely Lough Meelah. With packages under €200 per night including breakfast and dinner as well as gorgeous photos on the website, it looked like the kind of place a budget-friendly traveler might stop for the iconic Ireland castle stay. However, Kilronan Castle was a disappointment. First of all, it really isn’t an old castle. The original building was built in the early 1800’s. However, it was abandoned, and when the current owners bought it, all that remained were a few walls. 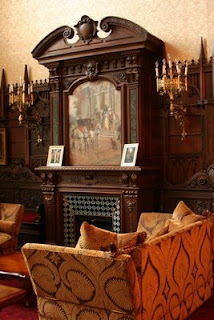 Within those walls, the owners have constructed a facsimile of a castle complete with dark wood, brooding fabrics, and crystal chandeliers. 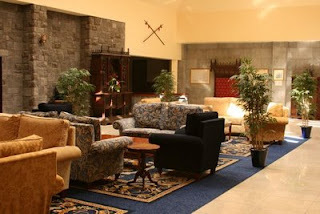 They clearly were inspired by Ireland’s famous castle inns like Ashford, freely borrowing names like “The Dungeon Bar” and “The Drawing Room.” And it turns out some of the photos on Kilronan Castle’s website and in their materials are actually borrowed from their sister-property, Lough Rynn. But all this borrowing hampers Kilronan Castle for the place lacks polish and a sense of self. Indeed, as I walked the hallways, I realized that nothing about the hotel said “Ireland” – not the furnishings, nor the artwork, and least of all the tacky mirrors emblazoned with the Kilronan crest. Even the printed materials in the hotel room left me confused. The “history” of Kilronan Castle made absolutely no sense with incomplete sentences, misspellings, and paragraphs that are clearly casualties of poor cutting and pasting. The Shower: good with nice bath products provided. We had a handicapped-accessible room, something many castles do not have. The floor, however, was not leveled correctly, and the water from the shower drained toward the door and the carpeting rather than into the drain. The Green Report: CFCs in all public spaces as well as in our room; no evidence of a recycling program. When we checked in the woman at the front desk had to check to make sure the electricity to our building was on. From the looks of the dark hallways, the hotel cuts power to unused portions of the buildings, though that may be motivated by finances rather than by environmental concerns. Children Welcome: There’s a lovely green lawn where children can play, and certainly this would be a less-expensive castle experience for aspiring princes and princesses. The pool is lovely when it is open, too. The castle does not have any special provisions for children, however. Notes: be sure to request a room in the “old” part of the castle, and the castle restaurants are the only options nearby, so you may want to bring some snacks. There are two parts to the hotel, and the rooms in the “old” part – within the old castle walls and near the front entrance – are clearly superior. The furnishings throughout the hotel are largely the same: large-scale wood furniture fashioned to look like over-sized antiques, dressed in brocades and damasks with exaggerated trims and plenty of pillows. But the rooms in the castle portion of the hotel appear to be much more finished than those in the odd adjoining building. Looking more like Medieval Times than a castle, the addition to the original building feels unused and unfinished. Indeed, I think we were the only guests in that portion of the hotel on the night we stayed at Kilronan. Our room was unfinished and a disappointing example of poor workmanship. 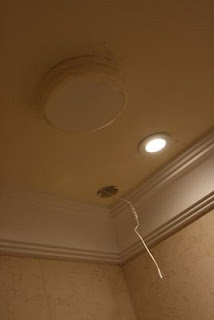 There were holes in the bathroom ceiling with wires sticking out of them. The bathroom floor was made from lovely marble, which sported large stains. An access panel for the HVAC system lacked any kind of covering, so we had a grand view right into the building’s ductwork. Two of the four windows in our room were so ill-fitting that they had 1/4” gaps around three sides. Much of the trim in the room was primed but hadn’t been painted, odd wires stuck out of the wall, the wallpaper was peeling… the punch list goes on and on. And mind you, this hotel has been open for more than a year. But more distressing even than the condition of our room was the view from our windows – construction detritus and bare dirt everywhere. There are some lovely, finished lawns at Kilronan, but much of the area around the castle is in dirty disarray with piles of pallets and debris and no attempt being made to hide the mess. From the looks of things, the owners ran out of money and opened the place long before it was ready. The promotional materials boast about the €50 million spent to open the doors, but it obviously was not enough. During my stay the pool, steam room, and spa were closed as was the Dungeon Bar. I had dinner in The Drawing Room, a sitting-room style bar which also serves food. Located in the “old” part of the hotel, the décor here is comfortable though several of the oil paintings need to be restretched and rehung (and one painting just outside in the hallway has a large hole in it). Like the paintings, our meals showed a lack of care. I’d chosen the B.B.Q. Gourmet Beef Burger (€15.75) from the bar menu which said it would be served “in Floured Bap” (a kind of Irish roll). Instead the overcooked burger lay on a rather stale hamburger bun; the meat had clearly been fried, not grilled or bar-b-qued as advertised. My traveling companion ordered a fillet of salmon (€15.95). She was initially served the wrong entrée, which the server quickly corrected. But she, too, was disappointed with her entrée finding it to be flavorless and uninteresting. Having said all of that, I firmly believe Kilronan Castle has potential. The small staff was kind and helpful. They spoke of plans for kayaking and rafting on Lough Meelah, and it sounds as if a great deal of their business comes from weekend weddings which might be quite charming there. However, if Kilronan Castle truly wants to live up to their promotional materials, the campus simply must be finished and cleaned up. But more importantly, Kilronan Castle must develop its own identity and live into its own history rather than scabbing from other landmark properties. Kilronan Castle is north of Boyle in Co. Roscommon. The directions on the castle’s website are clear, and they have done an excellent job of putting signs along the long and remote route. Boyle Abbey in the town of Boyle is worth a visit. There is a lot of restoration work being done right now (to be completed in 2011), so the church itself can only be seen from the outside. But you can ask for a guided tour. Our guide, Eugene, was excellent, and helped us to make sense of what we were seeing. The best part: entrance to the Abbey and the tour are both free. 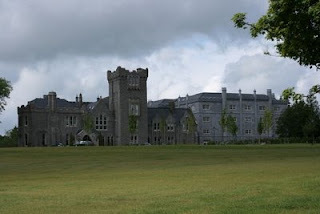 Note: Kilronan Castle sponsored my stay by providing me with a one night stay at the hotel. Read more about my review policies.